Sure, you can have just plain boring pork chops for dinner, but how about making this easy fig sauce to make them taste amazing? Paleo, Whole30, AIP, gluten-free and easy enough to make for weeknight supper. Fall is one of the few times of the year that fresh figs are available in stores in the US and it's a good time to take advantage of this rare ingredient. Sometimes I think we get in a rut with our dinners and buy the same ingredients over and over and over. But figs just are a quick flash in the pan in terms of availability, so it's fun to grab some and make some new, exciting dishes with them. This, like my Tomato Jam recipe from last week, is one of those sauce kind of recipes that just elevates your boring old meal. It doesn't take that much more time and it's just something to keep you inspired and off the bored-out-of-your-skull-with-your-meals train. Plus it's totally doable for a weeknight dinner, and if need be you could make the sauce ahead of time. In a large cast iron pan, cook the bacon slices. Once the bacon is done, remove from the pan but keep the bacon fat in the pan. Let the bacon cool and then cut/crumble into small pieces. Melt the lard or coconut oil in a separate large saucepan. Add the diced shallots or onions to the saucepan and cook until translucent. Add the figs, orange zest, lemon juice, vinegar, rosemary, salt, and bacon pieces into the saucepan with the onions. Also pour off approximately half of the bacon grease from the cast iron pan into the saucepan as well. Simmer the fig mixture, stirring occasionally, for approximately 20 minutes, until the figs have softened and broken down a bit. Meanwhile, heat the cast iron pan back up again over medium-high heat. If there isn't much bacon fat left in the pan (you need just enough to cover), add some lard or coconut oil as well. Generously season the pork chops with the salt and pepper and add to the preheated cast iron pan. Cook the pork chops 5-7 minutes each side, depending on the thickness. Serve the pork chops with a generous serving each of the fig sauce. Yes, you can make this with dried figs. The consistency will be different, but it is still delicious. 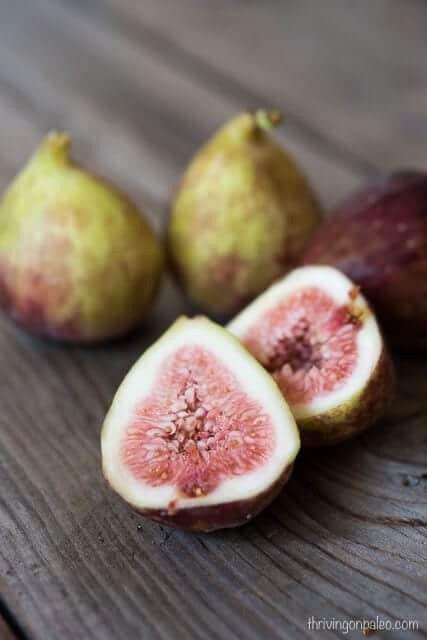 My recommendation is to soak the figs in water for 10 minutes before adding to the saucepan just to get a little moisture into them.